Sick of Valentine’s Day looks yet? Ok good. Me neither haha! You know my love for Evereve runs deep. So it only made sense to find the cutest, casual Valentine’s Day outfit with Evereve pieces. This outfit is not only perfect for love day but has key pieces you will wear all spring. Evereve is always my go to for finding quality pieces that are so so versatile. Pieces that you will have for years, from the best brands and that can be styled a million different ways. It was love at first site when I spotted this denim jacket from Free People. While it looks like a shirt it’s actually a jacket. I wore the heck out of this jacket from Evereve seen in this blog post all winter. This denim jacket is the perfect throw on and go but make a statement jacket. Honestly, watch the compliments roll in when you wear this jacket. The distressing just adds the edgiest vibe and this jacket is roomy enough to wear over sweaters while it’s still cold. I’m wearing a size small and the fit is perfect. Cannot recommend this jacket enough. SO SO GOOD! 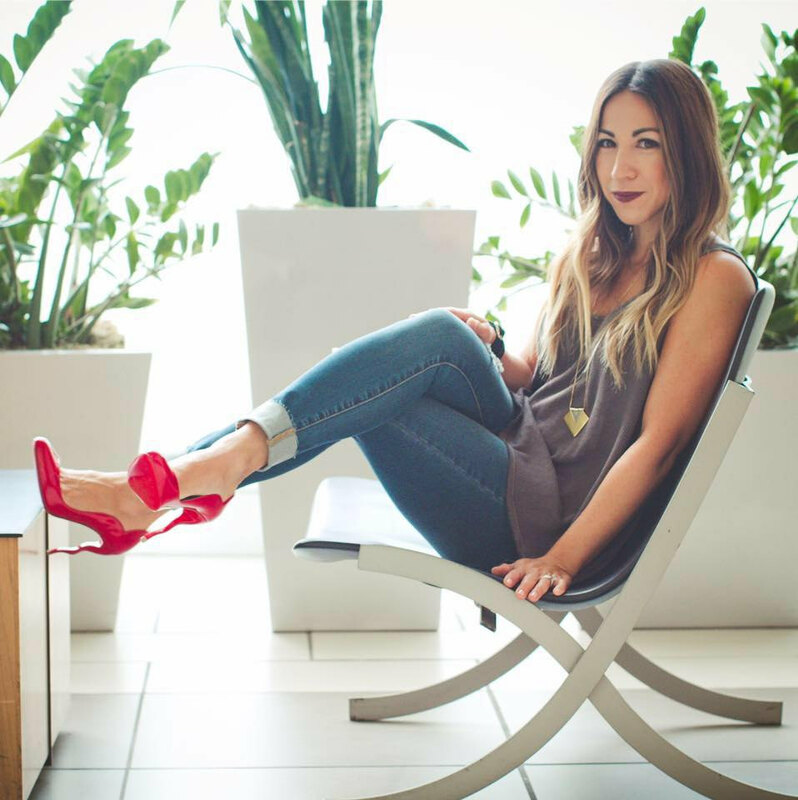 It will make the most perfect casual Valentine’s Day outfit that you can wear all spring! So I finally took the plunge and got the Spanx moto leggings. I have been wearing my camo leggings from this blog post a ton but I wanted a pair to rotate with. These moto ones are so good. Again with the edgy vibe that you can dress up or down. Throw on boots or slip on sneakers with these leggings for the cutest, casual Valentine look. I’d recommend sizing up 1 in these leggings. I’m wearing a small. Ps your hubby will go nuts over these. Erik still hasn’t stopped staring haha. 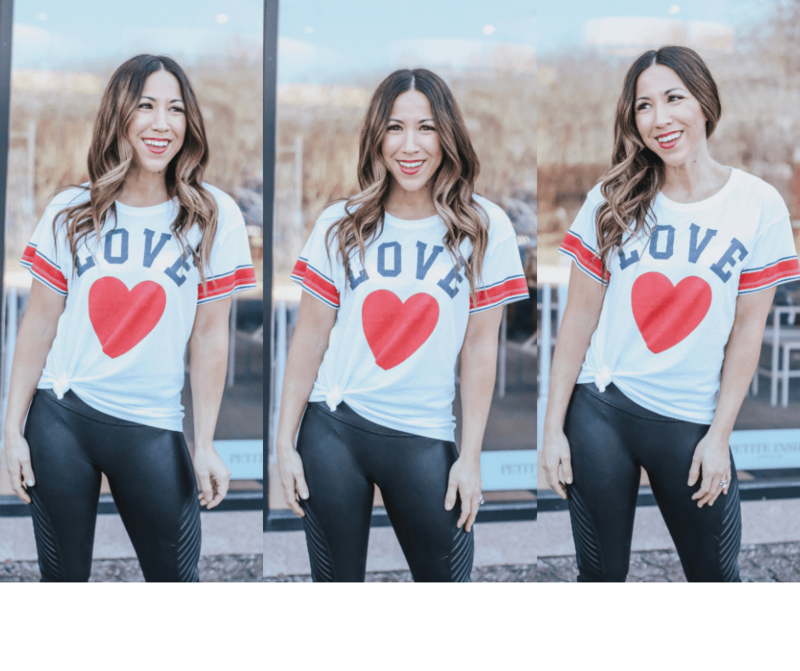 And no causal Valentine’s Day outfit is complete without a cute love day tee. I adore this one from Chaser. The softest cotton ever and looks so cute tied or worn down. I’ve said it before and I’ll say it again — Evereve ALWAYS has the cutest graphic tees and always made so so well! Ok Erik. I’m ready for date night this weekend. Get us a sitter and let’s go out! Fine. Summer can come too.